Elephants are BIG! When a baby elephant is born it weighs about 250 pounds -that's about as much as a heavyweight college linebacker of a human football team! That's big! But it's not by accident! Even after growing in their mommy mammal's tummy for nearly two years (22 months to be exact) they have a lot more growing to do. The mamma elephant selects a few females who will give constant care for her delightful little one as soon as it is born, giving her time to forage so she can provide her baby adequate nourishment. 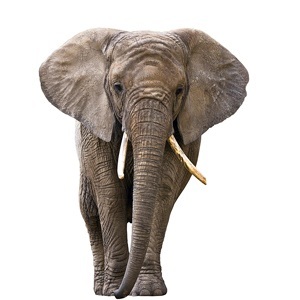 Male elephants in Africa, with the huge ears, will weigh anywhere from six to thirteen tons when they are fully grown, while the male elephants in Asia will weigh up to seven tons when grown, depending on location. These animals that have greater weight than any other land animal on this earth can eventually weigh as much as a school bus—yet they must eat to keep moving! Not by accident their Creator gave the elephant outstanding memories. And elderly matriarchs that lead elephant herds single file through forest or grasslands make excellent use of that gift. They remember, years later, the location of vegetation and water holes to keep these huge herbivore eating "machines" supplied with nourishment during 16 hours of daily browsing- not by accident providing sustenance to birds, beetles, monkeys, etc. who daily pick through 80+ Ibs of undigested poop dropped along the way! Watching elephants consume food is fascinating. They obtain it through their God-given useful tool we call a trunk. It's their signature characteristic and well should be. A trunk is a not-by-accident all-fusion nose-and-upper-lip instrument of approximately 150,000 muscles and nerves with enough dexterity to be wrapped around a tree the elephant needs to shake to release delicious fruit or leaves from top branches, gentle enough to pick up one blade of grass from the ground, or strong enough to uproot trees or branches that in the elephant's mind need to be tossed out of the way! An elephant should have a problem with its heavy weight because when it steps deep into mud its feet swell. As it stands there for a time, one wonders how it will extricate itself. But the Creator planned ahead. Its design is not by accident. When the elephant lifts a foot, the swelling immediately disappears, the foot becomes small and is effortlessly lifted and moved forward freely! And although an elephant's skin is one inch thick over most of its body, it has enough not-by-accident sense to protect itself from damaging sun rays by sometimes sucking up 18 quarts of water at a time with its trunk and blowing it on itself for cleansing. (Then it blows a mud cover over its body like sunscreen mudpacks.) Also, for relief from the African sun, not by accident the Designer placed fine webs of blood vessels in the elephant's ears so that as it flaps its large ears, it lowers the blood temperature by 10 degrees. The blood moves on through and the elephant's entire body is cooled. The instinctive fanning produced inexpensive a/c! Elephants not only hear with ears, but have been given not by accident hearing receptors in their trunks and feet and can feel subsonic tones through the ground, communicating long distant messages directing them to companionship and food. One reason I fell in love with this enormous creature was due to its intelligent, gentle personality traits. For example, all of the herd crowd around to nuzzle and comfort when a baby elephant cries. Elephants are known to laugh, play, caress, purr, grieve, and greet returning "family" when they have been gone or are missing for a time. Elephants let each other know they care. Since our Creator put those same emotions in us, should we not do the same?